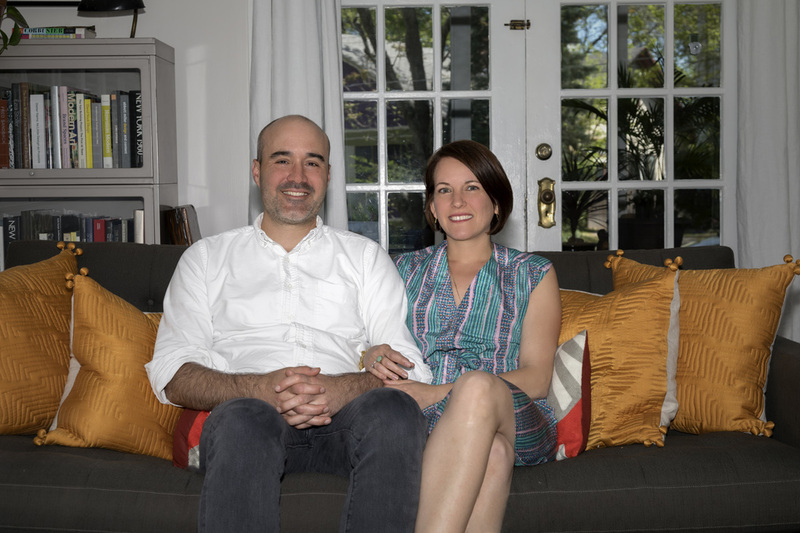 Four years ago, Thomas DiNatale and his wife, Allison Sall, made the move from Brooklyn, N.Y., to Inman Park, where they settled into an apartment. However, not long after the birth of their now 4-year-old son, Theo, they knew they wanted a house with more space. 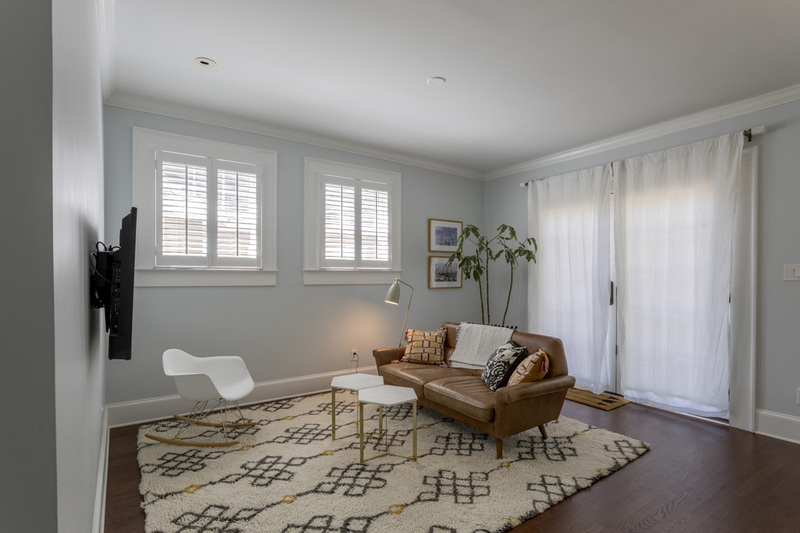 Two years ago, they searched Inman Park and the surrounding neighborhoods before finding what they wanted in Poncey-Highland: a circa-1926 house with a good-sized yard. The couple redesigned the kitchen to improve the flow and take advantage of the backyard view. Of course, that “connection” needed some help. When DiNatale and Sall bought the house, the kitchen broke up not only the cross ventilation with a blocked doorway (essentially a pass-through window), but also the entire flow of the house. 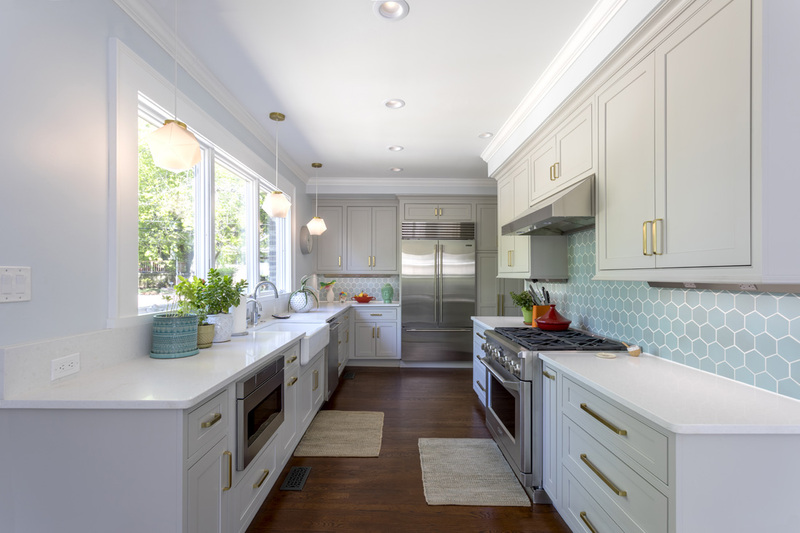 As part of the renovation, the couple redesigned the entire kitchen with Brad Cruickshank, owner of Cruickshank Remodeling in Morningside. Initially, the back wall of the kitchen included a single exterior door, as well as double and single windows. The stove also sat on that back wall. DiNatale and Sall traded in the single exit for double doors and exchanged both windows for one large picture window. They also moved the stove to the opposite wall and installed a Kohler farmhouse sink under the picture window. The refrigerator was also relocated to a side wall next to the stove’s new location. Thanks to a new Sub-Zero refrigerator, GE Monogram oven and dishwasher and Sharp microwave, the workspace is much more conducive to cooking, something DiNatale enjoys quite often. Pendant lights from Oregon-based Schoolhouse Electric and tile from Heath Ceramics provide beautiful yet understated finishing touches to the space. An angled ceiling was replaced with a smooth one in the den. Although most visitors don’t notice these imperfections, DiNatale and Sall point out quite a few. For instance, the door to the guest bedroom slopes down at the top. Also, if you look at the baseboards in some of the rooms, they look uneven where they meet the floor. In fact, the floors were uneven in several parts of the house, so the couple leveled them off. You can see the height difference between the hall floor and the downstairs bathroom, which is separated by a slope in the bathroom door casing. The couple evened them up. These quirks are just some of the home’s charms that make both DiNatale and Sall laugh. They attribute the oddities to the various previous homeowners who did their own renovation projects through the years. “It was all very DIY, like the way the wires [were run throughout the house],” DiNatale says. 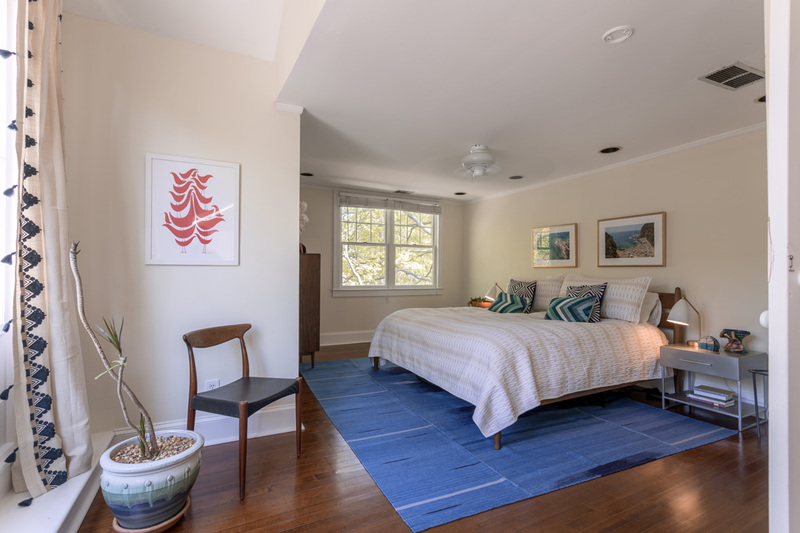 “And I think it was a duplex at some point,” he adds, referring to the home’s two front doors, a deadbolt on the guest bedroom door and an apparent relocation of the staircase. The couple used art and accessories to add pops of color throughout the home. Now, as part of their own renovation and decorating, DiNatale and Sall have added charming touches to make the house a home. For instance, using white as a backdrop, they’ve added pops of color and whimsy with art. One example is the greens and golds found in the print depicting the natural history of the “dragon’s teeth” flower above the fireplace the couple purchased from 1stdibs, an online marketplace the couple worked with when they owned their own design firm before it merged with their current employer. 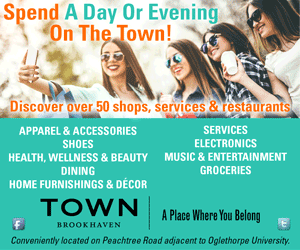 Other examples include the black and red digital print in the dining room of a photograph of David Bowie taken by the late star’s personal photographer, as well as many framed photographs taken by the couple during their travels. Another quirky touch is the “coffee table” in the living room that is actually a bricklayer’s cart. The couple purchased it from a previous tenant of the office space they rented for their design firm. And upstairs, there is the neon “Be the cool girl” sign, which served as the firm’s motto and was a phrase Sall used to recite to herself when she got nervous. The couple had the sign made in 2013 to celebrate their business’s one-year anniversary. 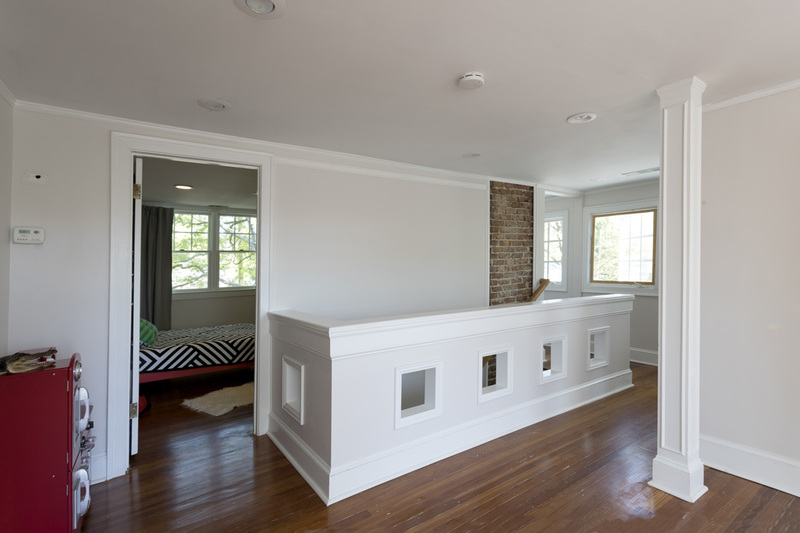 The exposed brick is another of the home’s quirky features.